The 5057 is seen leading a train out of Tacoma in January 1980, three months before the Milwaukee Road abandoned the Pacific Coast Extension. Photo by Brian Ambrose. The 5057 was one of 12 General Electric U25B locomotives purchased by the Milwaukee Road in 1965. They were initially assigned to the railroad’s most important freight trains between Chicago and Tacoma. Within a few years they were reassigned to trains at the east end of the system, until the Milwaukee Road decided to base their General Electric locomotives in Tacoma in 1971. During the 1970s, the 5057 and the rest of the U25Bs were commonly seen on trains on throughout Washington. The 5057 itself helped pull trains from Tacoma on the mainline through South Cle Elum during this period, as well as trains to Bellingham, WA and Portland, OR. The 5057 at Kent in March 1975. Photo by Brian Ambrose. 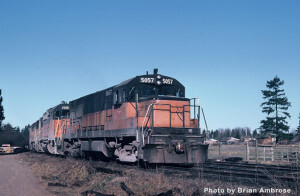 When the Milwaukee Road abandoned Washington in 1980, the 5057 helped pull one of the last trains eastward. Of the locomotives that pulled the last three trains out of the state, only the 5057 and fellow U25B 5056 are still intact. The others have been scrapped or substantially reconfigured. The 5056 is preserved at Illinois Railway Museum in Union, IL. 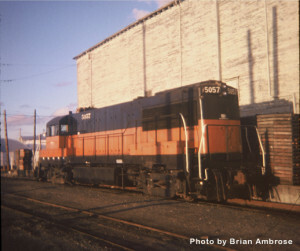 In addition to its relevance to the history of the Milwaukee Road in Washington, the 5057 has broader historic significance because of the type of locomotive it is. The U25B model was a breakthrough locomotive for General Electric, giving it a successful entry into the market for railroad locomotives that had been dominated by other companies. Today General Electric is one of the dominant manufacturers of railroad locomotives. The 5057 is one of only seven U25B locomotives that still exist. When it entered service in July 1965, the 5057 was number 388. When the Milwaukee Road renumbered their U25Bs in May of 1968, the 388 became 5007. The U25Bs were renumbered again in July 1974 and the 5007 became 5057. It still carried that number when the railroad sold it in 1984. It went to Webster Technical College in Sidney, NE in 1984 and then was donated to 1991 to the Portola Railroad Museum (now the Western Pacific Railroad Museum) in Portola, CA. You can read more about the 5057 at the Western Pacific Railroad Museum web site. Great idea! I enjoyed working for the Milwaukee Road both in Tacoma, WA and Milwaukee, WI. and just donated, as it would be great to have a Milwaukee Road locomotive back in WA on display! As the 2nd shift roundhouse foreman in the 70’s, I got along well with the men who worked under me. We had a East-bound train (200) that we always tried to get called by 6pm which was quite difficult to do due to many reasons. I was able to get the guys to aim for and get a 6pm call for that train; the first time in many years! I’m sure I couldn’t have done it if it weren’t for the respect the men had for me and I for them. It’s a shame the Milwaukee Road did not last, but unfortunately it did not. Keep up the good work; my wife and I plan on attending the next M.E.A.L. to see if any of the old Tacoma employees attend.